The Beauty of Loulan. 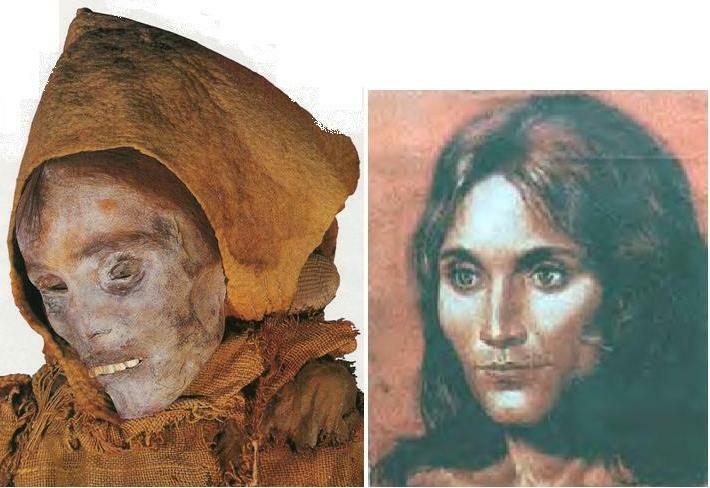 A 3000-4,000 year-old mummy of a woman with red hair and Indo-European features found in the Tien Shan Mountains in northwest China. She was either a member of a proto-Iranian tribe or a proto-Celtic group that had migrated eastwards along with the proto-Iranians. The left photo is a reconstruction of how she would have appeared in life. As late as the closing decades of the 4th century B.C., the Iranian peoples were still the largest and the most widespread group within the great Indo-European family; this position must have been held for thousands of years by their nomadic ancestors, and was not relinquished until well into the Roman period; during those distant millennia, they roamed the vast, limitless Eurasian steppes as pastoralist riders and charioteers; towards the end of the second millennium B.C., some of them, lured by the great civilisations of the Indus vally, Elam, Mesopotamia, and Asia Minor, moved southwards and made permanent settlements; it didn''t take very long for one group of these settled people, the Medes, to form the first of the four Iranian empires, and less than 500 years for the Persians, to become the absolute masters of the known world; their nomadic ancestors, however, continued to roam the steppes, unopposed, for a very long time; it was not until the 5th century A.D. that the invading Turkic tribes pushed them out of their homelands into central Europe and further west; by then, of course, vast numbers of them had merged with eastern Europeans to form the core of the modern Slavs ; the rest were eventually assimilated in western Europe, especially in France; the intention of this paper is to give a broad outline of the history and the culture of these fascinating warriors, who for many thousands of years remained the indisputed masters of the steppes; throughout their long nomadic history, they are known to us by a variety of names, both native and foreign. We owe a great deal to these pre-historical Iranians, one of whom, i.e, Zoroaster, is generally regarded as the first of the great prophets, and the earliest of the great thinkers; his people, in the holy texts, are referred to as Airyas, and their homeland, believed to have been somewhere in Eastern Iran, as Airyana vaejah; the word Ariya, noble, is also attested in the Inscriptions of Darius the Great and his son, Xerxes; it is used both as a linguistic and a racial designation. Darius refers to his Behistun inscription (DBiv.89) as (written) in Ariyan; he and Xerxes state in their surviving texts in Naqsh-i Rustam (DNa.14), Susa (DSe.13), and Persepolis (XPh.13): (adam) P~rsa, P~rsahy; Ariya, Ariya; meaning: I am Persian, son of a Persian; an Aryan, belonging to the Aryan race. The fact that Iranians, Indians, and probably some Europeans also called themselves by this name, suggests that the word Airya may have been an old native designation for the racial group now called Indo-European, Indo-Germanic, European, Caucasian, or simply, White; it was indeed adopted in the middle of the 19th century as a collective designation for the above racial group and their languages. It seems that both nomadic and sedentary Iranians referred to themselves as Airyas; gradually, however, this word became a self-imposed designation for the settled Iranians only, who began to refer to their nomadic cousins in the East, i.e., Zoroaster''s people, as the Saka, and some of those further west as SKUDRA ; the Saka probably did not call themselves exclusively by this name, some may have retained the use of the term Airya. Many Saka tribes left the northern steppes intermittently to settle permanently in Central Asia, modern Afghanistan, and Persia; these tribes are the direct forebears of the imperial Western Iranians, the Medes, Persians and lastly, the Parthians; Once converted to Zoroastrianism, however, such became their religious significance, that by the middle of the 1st millennium B.C., the centre of the faith was neither in the homeland of its founder, nor in any of the adjoining Eastern Iranian regions; it was firmly established on the western side of the great salt desert, amongst the people now called Western Iranians; from then onwards, Eastern Iran fades into the background; we now deal almost exclusively with Western Iran, and until very recently, were not even aware of the fact that Eastern Iran had played such a vital part in the genesis of the Iranian empires, and their great national faith; most scientific facts, such as, the recorded history and Near Eastern archaeological data, especially a large volume of deciphered inscriptions, relate to the four great Western Iranian empires of the Medes, Persians, Parthians & Sasanians; there is only a small volume of classical sources, and more recent archaeological data, which also deal with the nomadic Iranians of the northeast, i.e., those Saka warriors who remained in the steppes, and were never completely subdued by the settled Iranians of the imperial period; these warriors remained, nonetheless, a very formidable enemy of their settled cousins; not only did they conquer and rule the Median Empire for 28 years in the 7th century B.C., but they also defeated and killed Cyrus the Great, founder of the Achaemenian Empire, in the following century; a generation later, they were still engaging Darius the Great in many hard-fought battles; two hundred and fifty years later, however, they became the saviours of the Iranian culture and religion, and political integrity; they gradually pushed the Macedonians out of the Iranian homeland, and formed the Parthian Empire, which lasted for another 500 years. The nomadic Iranians of the north western steppes, however, especially those settled in Europe, are extensively covered by the classical writers; they are also attested in a very large number of archaeological excavations in Eastern Europe; these Iranian peoples are known in the West as Cimmerians, Scythians, Sarmatians, Alans, and finally Ossets; it must be emphasised that all these names refer to the successive migratory waves of the same people, who probably called themselves by a name derived from the word Airya, as the Alans did, and the Ossets still do. This is by far the most important, and enduring designation given by the classical sources to the nomadic Iranians of the steppes; the name refers to the entire non-sedentary Iranians, both in the West, and in the East (the Saka). Greek records place them in southern Russia in the 8th century B.C., however, recent archaeological evidence testifies that they, Cimmerians, and other Steppe Iranians may have been there far earlier. Greek geographers of the 4th century B.C. also credit the Scythians with inhabiting the largest part of the known world (map Red 16). Like other Iranians, these nomads probably called themselves by the generic term "Airya"; this is testified inter alia by the native name of their descendants in the present day Europe (see below); it seems, however, that they, or at least some of their powerful clans, also called themselves "SAKA" in the East, SKUDA, or SKUDRA  in the West. SKUDA is believed to be related to the German word "SACHS", meaning a type of throwing-dagger which the eponymic Saxons used to carry and shoot with ; indeed, it is possible that like the historical Saxons, the Skuda derived their name from their ability to shoot. [cf. Franks]. Their first appearance in recorded history is again in the Assyrian annals, where they chase the Cimmerians, their own kinsmen, first out of Europe, then out of Asia Minor into the Median territory; in the 7th century B.C. they allied themselves with the Assyrians, and attacked the combined forces of the invading rebellious Median vassal king, Khshathrita (Phraortes in Greek, Kashtariti in Akkadian) and his Cimmerians allies; the Assyrians repelled the Medes, killing Phraortes, and routed the Cimmerians; the real victors, however, were the Scythians; for the next 28 years, now allied with their erstwhile enemy, the Cimmerians, they ravaged most of the Ancient Near East, including Media; later they allied themselves with Khshathrita''s son, the Median emperor, Hvakhshathara II (Cyaxares in Greek, Uaksatar II in Akkadian), and the Babylonian king, Nabopolassar, taking Nineveh in 612 B.C. and destroying once and for all the mighty Assyrian Empire. (beginning of the Kurdish calendar) The Scythians were called by the Assyrians Ashkuza or Ishkuza; as with the Gimmiri, this word also appears to have found its way into the Old Testament; one of Gomer''s (Gimmiri) three sons, in Genesis I.x.12, is called Ashkenaz, which has given us the modern Hebrew word, Ashkenazi . The Scythians were known by the Achaemenians, as SAKA and SKUDRA, by the Greeks, by the Romans, SCYTHIAE (pron. SKITYAI), which has given us the English word SCYTHIAN; they lived in a wide area stretching from the south and west of the River Danube to the eastern and northeastern edges of the Taklamakan Desert in China; this vast territory includes now parts of Central Europe, the eastern half of the Balkans, the Ukraine, northern Caucasus, southern Russia, southern Siberia, Central Asia and western China. The Scythians, and other early steppe Iranians are believed to have been the first Indo-Europeans to use domesticated horses for riding (as opposed to eating); this theory has acquired fresh credibility after the recent discovery of horse skeletons at the Sredny Stog archaeological culture, east of the River Dniepr, a well-known pre-historical Scythian site in eastern Ukraine; these bones were identified as belonging to bitted, therefore, ridden horses dating to 4000 B.C., at least 2500 years older than the previously known examples. More recent excavations east of the Ural Mountains credit them also with the invention of the first two-wheeled chariot ; such mobility, naturally, turned them into a formidable fighting force; they never willingly fought on foot, and used armour both for themselves and their mounts; they also developed the famous steppe tactic of faked retreat, and the "Parthian shot", shooting backwards while on mounted retreat; this tactic, named after their well-known descendants, the Parthians, requires an amazing skill and balance in the saddle, and a dazzling co-ordination of eyes, arms and breath without the support of stirrups.